We kicked today off with a talk by Zack Arias. He was... Zack. Well, he started out as Zack giving a talk, but soon after it was like reading one of his blog posts, or his book. My wife—who is a decidedly less of a photo nerd than I—also enjoyed Zack’s tips, found him charismatic, and could relate to his approach to street photography. Next we spent some time at the Fujifilm booth. The hands-on stars of the show were the X-T1 Graphite Edition, and the 50-140mm f/2.8. Sadly, Fuji aren’t ready to let us mount the 50-140mm on our own cameras or put one of our own SD cards in their 50-140mm-mounted X-T1 so we can’t post samples yet, but the build, and image quality I was seeing on the LCD were both exceptional. Autofocus was fast, but slightly inconsistent. I have no doubt this will be remedied by the time the lens goes to production. The lens is large, but it doesn’t feel as front-heavy on the X-T1 as I was expecting. At 995g, it’s 2/3 the weight of Canon or Nikon’s equivalents, and that all-internal focus keeps the overall length consistent. The X-T1 Graphite Edition was nice. It’s essentially an X-T1, but in a silvery graphitey colour. It looks pretty cool from the front especially, and Fuji wanted to ensure I knew the graphite coating was a 6-step process with the colour being baked onto the camera, vs. just bare aluminum. Whether that’s worth the premium on price, well, you guys will decide that. 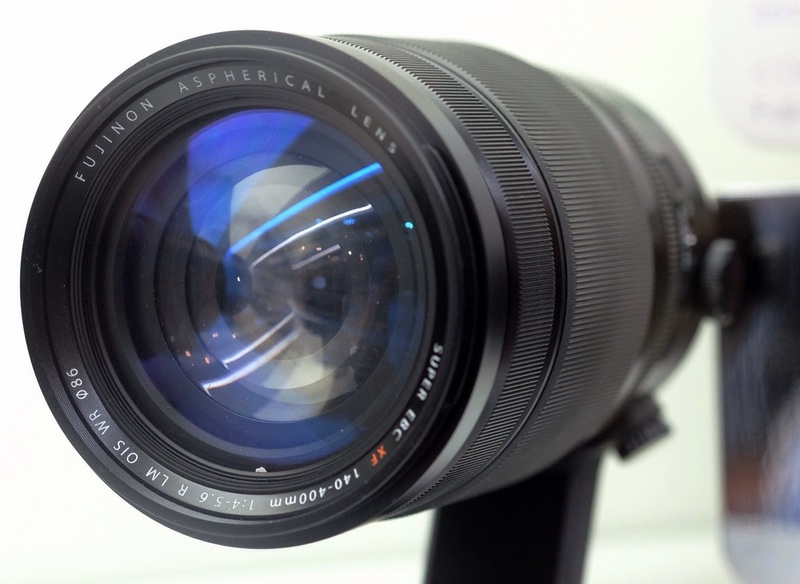 The 90mm f/2 was on display, behind glass, and sort of tucked away. It is one hefty-looking piece of glass. 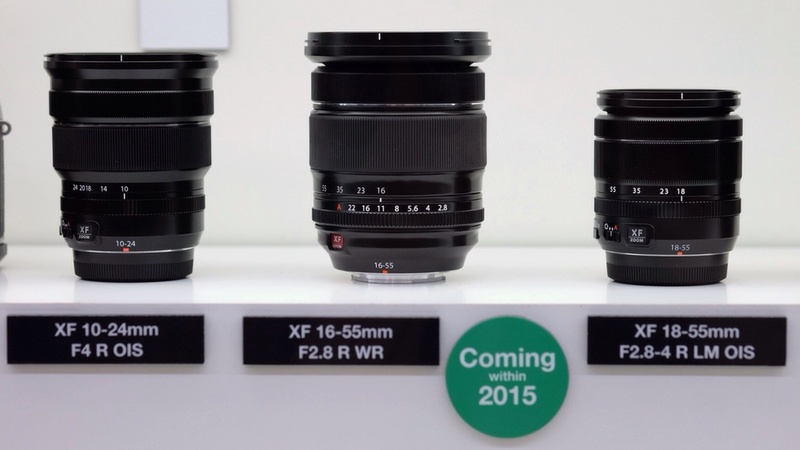 That lens looks to be around the same length as the 56mm f/1.2, but considerably thicker. EDIT: After a second viewing, the clear the 90mm is going to be substantially larger. It’s pretty much a proportionally scaled up version of the 56. I’m looking forward to that lens, but I have a feeling it will really call for the VG-XT1. Another one behind the glass, but some preliminary specs were revealed. The lens markings say 140-400mm f/4-5.6. I’m told that’s not quite final yet though. The lens is another thick one—this is Fuji’s sumo year I think—but the prototype doesn’t appear longer than the 50-140mm. There is quite a range on it, but I hope they find a way to make it an f/4 constant. There’s something about variable apertures I’m just not into. And finally, Fuji’s standard zoom is still behind glass. This is one A lot of people are most eager for and sadly the release date slipped, but I’d rather they get it right rather than rush it out. Here are some more comparison images. It’s surprising how much larger this lens is compared to the 10-24mm f/4. This one was hiding on from me. I didn’t even realize it was behind the glass until the second day. As far as size goes, the 16mm f/1.4 doesn’t appear to be a great deal larger than the 14mm f/2.8, although I think Fuji maybe have been playing a trick on us as in the comparison image below, the 16mm is the only one that doesn’t have its rear cap attached. One thing that’s extra nice is the focus ring that’s pulled back for manual focus, that reveals the engraved depth of field markings. After scoping out some other players, we made it back to the Fuji booth in time to see fellow Canadian, Patrick La Roque speak. Patrick is a super nice, down to earth dude whose work I really admire. He spoke about storytelling, and then did a live demo—models and all–that turned out really well. I spent a lot of time checking out the other players of course, but one standout for my readers was Phase One. No joke, I was going to ask Phase One about any updates planned for Capture One when the email announcing version 8 landed on my inbox. Sadly, I couldn’t find anyone who spoke enough English to walk me through the new features, but I’ll try again tomorrow, and will look into updating my Raw Converter comparison once I’m back home. I’ll be back for more tomorrow, but for the most part, I think one day at the show for consumers is plenty. I’m pretty happy to have just the one brand to cover. Fuji vs. Fuji is headed to Photokina! This year I am fortunate enough to be going to the big show. I hope to do a bit of live reporting from the show floor—and of course, the Fujifilm booth. Afterwards, we’ll be extending our trip to a couple of weeks in Europe. As a result, Fuji vs. Fuji will be on a bit of a hiatus during that time, as we put our Fuji gear to good use.